So, you lost the keys for your motorbike. Don’t fret. Our Locksmith in Charlotte, North Carolina from A-Access Lock & Key dives into why you shouldn’t worry about lost motorcycle keys. Losing keys for any of your properties is a real pain. It could be your mailbox, house, office, or car. Losing keys to your motorbike means that you can cruise down the highway anymore and it’s also much more difficult to get around from one place to another. If you just bought your motorcycle from the shop, you cannot be sure that you are the only one with its keys, so you should have your bike rekeyed. If you lost your motorcycle keys or broke the key in the ignition, don’t panic, and don’t disassemble your bike. Instead, contact a professional Locksmith. We can help you with your rekeying needs, too. Our tools and equipment allow us to change the keys to your motorcycle quickly. A-Access Lock & Key Charlotte Locksmith will come to your location and make new motorcycle keys on the spot! We are the best choice in Charlotte for key replacement for all models and makes of motorcycles, including Kawasaki, Harley Davidson, Yamaha, Suzuki, Triumph, and BMW. Call A-Access Lock & Key at 704-545-5410 if you broke your key off in the bike ignition. While there are many locksmiths in Charlotte who offer broken key removal, not all of them have proper tools, which means that you are more likely to pay for the replacement of the ignition, too. Our technicians at A-Access Lock & Key are highly skilled and experienced in using the right kind of tools to ensure that no unnecessary damage to your ignition is incurred, and our advanced tools allow us to make new motorcycle keys for you, on the spot. With A-Access Lock & Key, you are guaranteed that your valuable property is made secure. We carry the most modern equipment so that we can tailor our services to your needs. Get access to your home, office, or vehicle. We are mobile, so when you call us at 704-545-5410, one of our skilled technicians will go to your location and make new or replacement motorcycle keys in as fast as 30 minutes or less, without damaging or changing the locks. You no longer have to wait for a long time or have your motorcycle towed to the dealership. We are a Mobile Locksmith in Charlotte, so all you have to do is call us, then sit back and relax while we work at replacing your motorcycle keys. For more than twenty years, A-Access Lock & Key has provided the city of Charlotte with expert automotive, motorcycle, residential and commercial locksmith services at great value. Our team consists of highly skilled and experienced technicians who are insured, bonded and licensed. 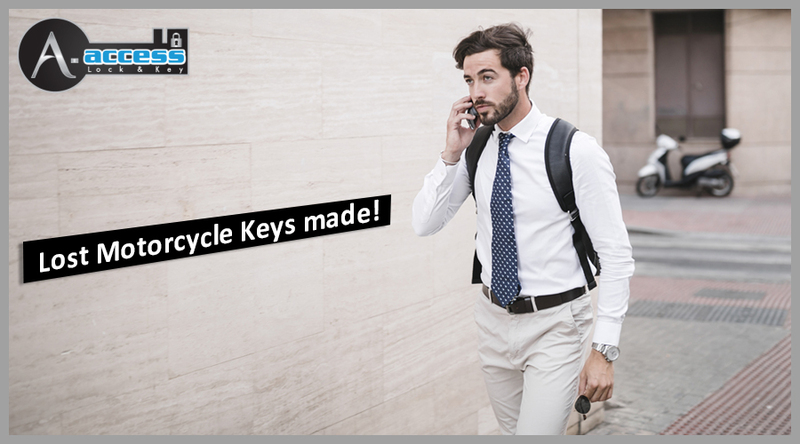 We can make you new motorcycle keys in a matter of minutes. Then, you can ride along wherever you want. Vroom vroom! Call us today at 704-545-5410 for any and all emergency lock and key services. Replace your lost Motorcycle Keys through our Expert Locksmith services!